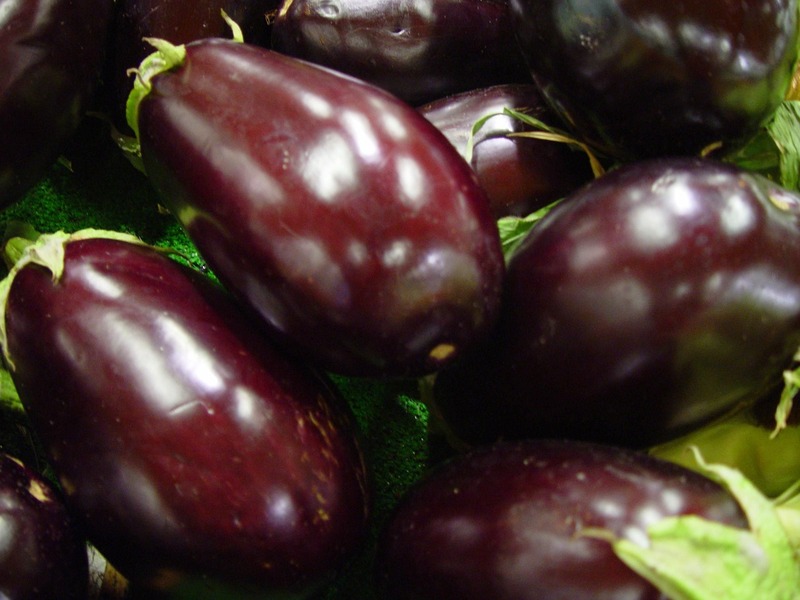 The aubergine, eggplant (US/Aus), brinjal (Asia/SA): by any other name it would taste as sweet! This wonderful vegetable has always held a special place deep inside my heart. Well cooked, the aubergine is indeed a dish to behold, something delectable and quite extraordinary. In stark contrast, when done badly it can often be rendered quite inedible, and I have a feeling it is for this reason that it has garnered such a stagnant reputation. The aubergine (Solanum melongena) is technically a berry, and rather shockingly, part of the deadly nightshade family (Solanaceae) . Fellow family members, interestingly all within the same genus Solanum, include the equally revered tomato and indeed the humble and ubiquitous potato! Given that these species were new fangled items brought over from the New World, they were clearly frowned upon when they landed upon these shores. Their association with the nightshade family meant they were distrusted even more: it brings to mind a joke in Blackadder 2. Melchett offers Blackadder a potato to smoke: he declines, scoffing that “people will be eating them next”. Great joke guys: it would have been perfection had you starred the aubergine instead! It’s been a while since I have harped on about the wonders of a particular food item, and it was just a matter of time before my beloved aubergine would turn up here! Meanwhile whilst I have been thinking about writing about it the rest of the world seems to have caught up with my obsession, as it has suddenly become the vegetable a la mode. So why, why, why do I think so much of this vegetable? Well, it’s just bloody, brilliant, isn’t it, that’s why! This, sentence, in my head, has been narrated by Captain Flashheart, played by the wonderful, wonderful Rik Mayall (may he rest in peace. I’m not sure what it is with me and Blackadder right now!). Of course, he would have said Woof! at the end of the sentence. The aubergine is just one of the finest vegetables to have evolved on this planet. Well, when I say evolved: that’s probably not quite accurate. I watched a fascinating TED talk: ‘Debunking the paleo diet’ by Christina Warinner, and in it she explained that most of the natural foods we eat now bear little resemblance to what was around in the Paleolithic Era. For example, we bred out the deadly nightshade toxins naturally occurring in tomatoes, and by inference, it is likely Man did the same with his aubergine bounty too. It is, I am sure, for this exact reason, that aubergines come in so many different shapes and sizes. Just as man domesticated the wolf and created such a diversity of dog breeds, so he or she also did the same with the aubergine. 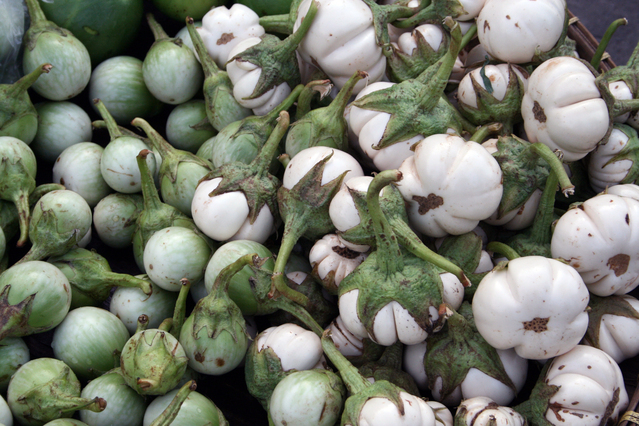 I was once familiar with the typical European large purple aubergine and the little mini versions, but now you can find all sorts: different shapes, sizes and colours (including the ones often found in Thai curries which are green, pea shaped and quite bitter). The holy union of aubergine, tomato, garlic and olive oil (which it readily absorbs) is unmatched. Aubergines have this open, spongy flesh which when cooked properly, yield to create a divine creaminess. When roasted or better still, burnt, they produce a lingering smokiness (an exaggeration of a faint smoky flavour they have anyway) I can’t get enough of. In order to do this, turn them in the fire of a gas hob: if you don’t have gas, grill the hell out of them instead to approximate. The spongy flesh and flavour can be very meaty, rich, umami-laden and satisfying (more on umami another day!). The burning of aubergines has always fascinated me, ever since my mother used to expertly make my favourite, baingan ka bharta when I was a little boy. As I have grown up I have learnt that many cultures do the same, but then take this precious cargo and move it in totally different directions based on their culinary traditions and predilections. I love to see the common threads in our food, just as in our humanity, and at the same time to notice what differs. So in North India we have baingan ka bharta, one of my favourite things in the world, where the smoked aubergine marries up with lots of onion, tomatoes, garlic, chilies, spices and oil to become so, so tasty! In the middle east we have Baba Ganoush where the smokey aubergine is met with olive oil, garlic and tahini. Closer to home, aubergine caviar can be found in Russia and neighbouring lands. Even more excitingly, we can take our precious roasted aubergine, combine it with what is essentially a cheese sauce, and then top it with a rich lamb stew. This dish Hunkar begendi, or Sultan’s delight, definitely delights this Sultan! Actually, I was flicking through the venerable Elizabeth David’s Mediterranean Food the other day (as you do) and discovered that she too has a similar Salad of Aubergines recipe which she describes as a A good dish from Greece and the Near East, where it is often served as a meze. Her recipe uses roasted aubergines, olive oil, lemons and parsley. This is a great juncture at which to introduce my own take on the roasted aubergine front, as my recipe, just by chance, takes those classic flavours and then goes further. I have rather megalomaniacally named this after me as it is a creation of mine: it’s kind of baba ganoush-ey but honestly, I think this is much punchier! We have influences from all over: the smoked pimenton is from Spain and naturally turns up the smokiness from the flame (and useful if grilling). The green chilli adds a more Asian note and an added kick, and then the heady aromas and textures of the herbs contrast beautifully with our silky, aubergine-ey backdrop! To me this dish combines wonderful flavours and textures, as well as outstanding nutrition. In this one dish we have a high diversity of ingredients and nutrient density. Your taste buds, your microbiome (gut bacteria), and your body will love this! 1 clove garlic, finely chopped or pureed. Take the aubergines one by one and put them directly on a gas hob, turning them occasionally until they are completely black on the outside and smell smokey (you are best putting foil down pre-emptively as this can get messy). If like me, you are not lucky enough to have gas, then wack your grill up to full power, put them directly under and turn occasionally until they have blackened all over and smell smokey and burnt (personally I would do this for around an hour or more to make sure they are burnt and smokey enough). Skin the aubergines and put the pulp into a blender with the olive oil and blitz. You can blend the whole lot to create a homogenous smooth, silky emulsion. I prefer to hold back a quarter and mash that leaving a bit of texture in the smooth mixture. Put the amazing creamy result into a bowl and now you can really add some flavour to this foil. Add the remaining ingredients to the bowl. The sum will be so, so much better than the parts: totally delicious! Serve with pita breads, sliced into batons, tossed in olive oil, salt and sumac, and crisped up in a hot oven (be careful to not burn them).